This winter has been a strange one. First it’s cold around –15F then 35F then back down to –10F and back up to 40F again. I’m not complaining. The warmer temps and lighter snow have been very pleasant. Last year’s winter was brutal compared to this year’s winter. 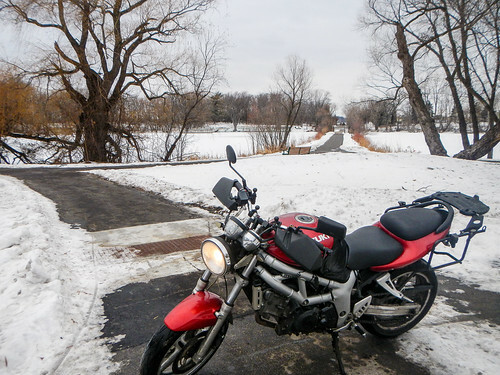 I took the SV650 out for a short ride since the temps were around 40F. I tried to get near some of the frozen lakes, but the parking lots near them were full of thick ice and hard pack snow. I don’t like riding on either of those two surfaces, so I found one that was only marginally covered. I rode for about an hour. When I started, it was 40F, and by the time I finished it was only 32F. The temperature dropped in a hurry. I’m not sure when I’ll get to ride the SV again, so this was a nice treat. KTM 790 Adventure R Revealed!